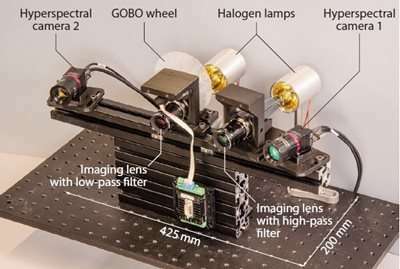 Researchers have developed a compact imaging system that can measure the shape and light-reflection properties of objects with high speed and accuracy. This 5D hyperspectral imaging system—so-called because it captures multiple wavelengths of light plus spatial coordinates as a function of time —could benefit a variety of applications including optical-based sorting of products and identifying people in secure areas of airports. With further miniaturization, the imager could enable smartphone-based inspection of fruit ripeness, or personal medical monitoring. The researchers created a prototype system with a footprint of just 200 by 425 millimeters—about the size of a laptop. It uses two hyperspectral snapshot cameras to form 3-D images and obtain depth information much like our eyes do by capturing a scene from two slightly different directions. By identifying particular points on the object's surface that are present in both camera views, a complete set of data points in space for that object can be created. However, this approach only works if the object has enough texture or structure to unambiguously identify points. To capture both spectral information and the surface shape of objects that may not be highly texturized or structured the researchers incorporated a specially developed high-speed projector into their system. Using a mechanical projection method, a series of aperiodic light patterns are used to artificially texture the object surface. This allows robust and accurate 3-D reconstruction of the surface. The spectral information obtained by the different channels of the hyperspectral cameras are then mapped onto these points. The researchers characterized their prototype by analyzing the spectral behavior of the cameras and the 3-D performance of the entire system. They showed that it could capture visible to near-infrared 5D images as fast as 17 frames per second, significantly faster than other similar systems.